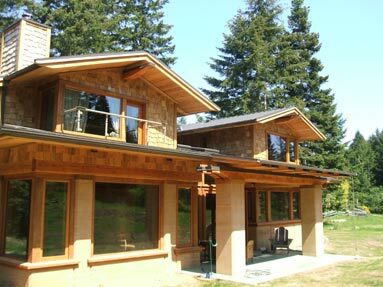 This rammed earth house is so beautiful, the fantastic finishing by David, Dewey and crew brings this house to another level. 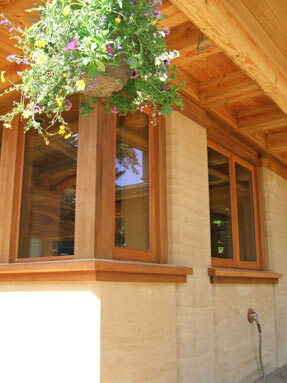 The fir trim and cedar window sills complement the rammed earth very nicely. The big wood beams you see in some of the following pictures were milled from trees on the farm. 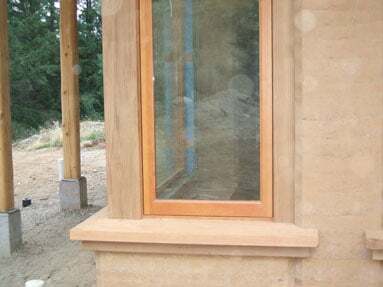 It is very satisfying to see this rammed earth house finished, when the walls come together with quality finishing and different types of beautiful wood it is very rewarding. 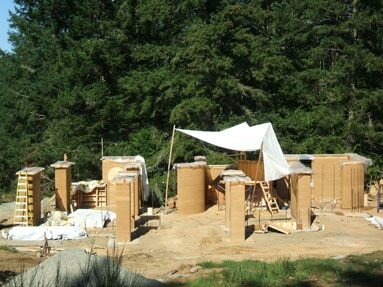 This view is looking at the living room and patio pillars. 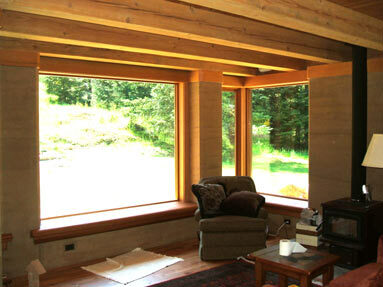 The wood window sills contrast the color of the walls perfectly. 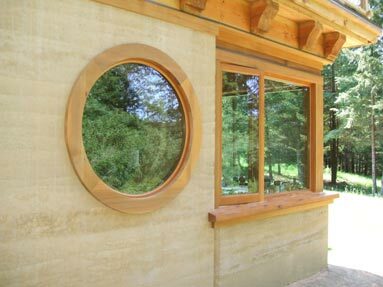 The round window through one of the office walls is an attractive feature. 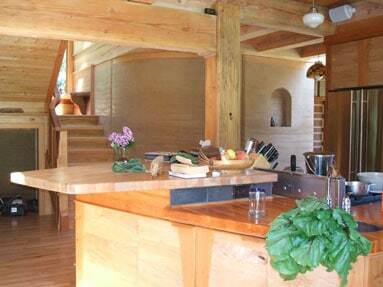 A view from the kitchen of the curved wall at the beginning of the stairs. There is an arched niche on the right hand wall that has a couple of small bronze statues in it. 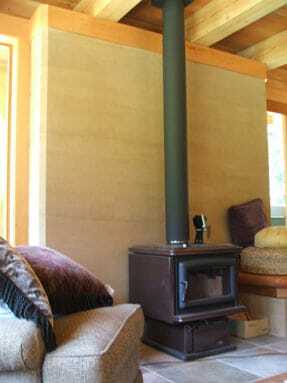 The fireplace wall in the living room will be great for storing heat. 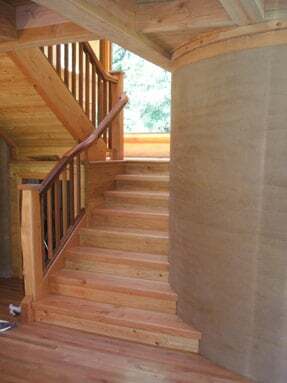 A curved wall gives a nice flow to the stairs. 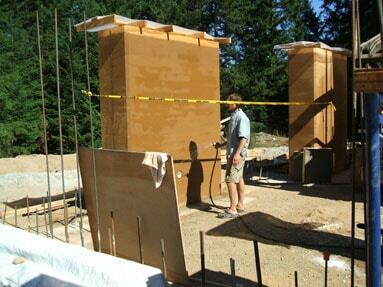 As you can see from these pictures quality rammed earth walls paired with quality finishing make for a sophisticated home with a lot of feeling. This was a great project for myself and the crew to work on; Stohl Lake farm is beautiful, the people are friendly and we had good weather to top it off. 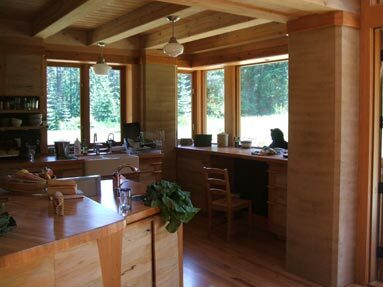 This is a great example of the layers in the rammed earth walls, the light is perfect, it’s early morning with the sun filtering through the trees. Spraying the walls to slow down the curing in the hot summer sun. 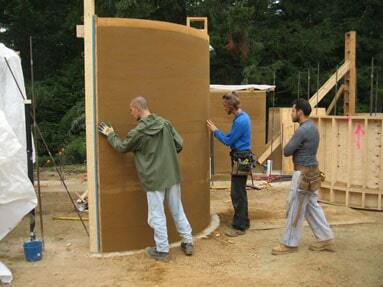 Forming a 1 foot thick interior curved wall. Inspecting the new wall the next morning. 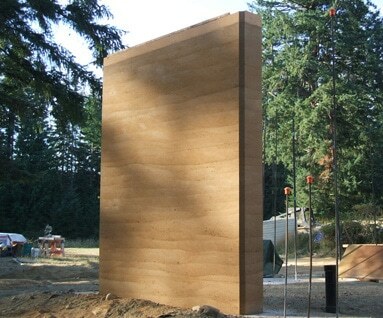 The wall color is dark when wet and will lighten up as it dries. David spraying some water on the mix. 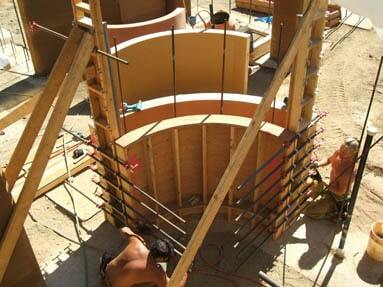 A view of our volume displacement drum for a round window. Top view of the drum. 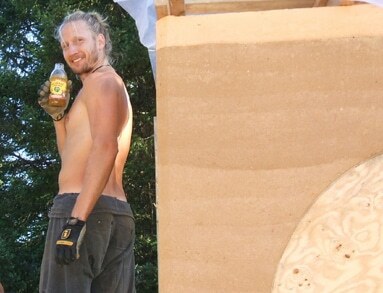 Rudy holding a bottle of Guayaki Yerba Mate. 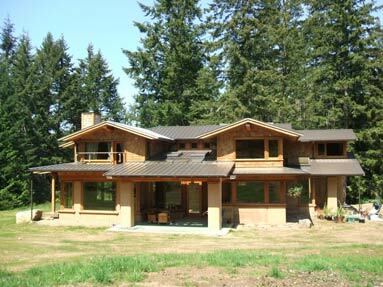 David our client is the founder of Guayaki and kindly supplied us during the hot summer of building, Cheers! 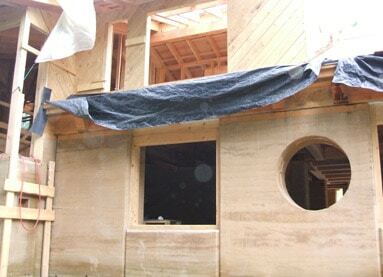 The round window after the drum has been removed. 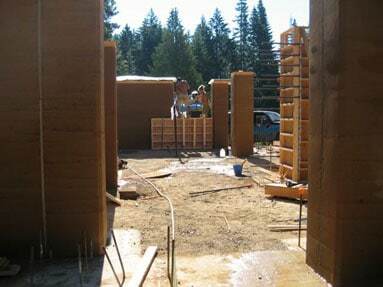 Making an infill, that’s the rammed earth under the windows between 2 larger walls. A view of the walls from up the hill. 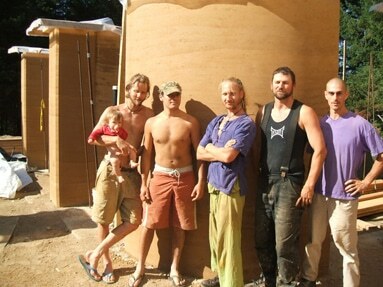 The rammed earth builders super crew. 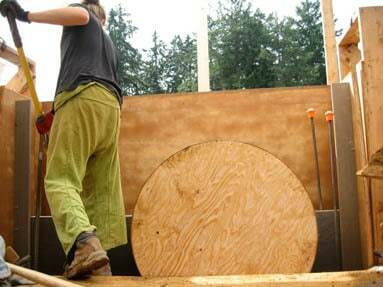 Hand tamping, this whole project was done by manual power. 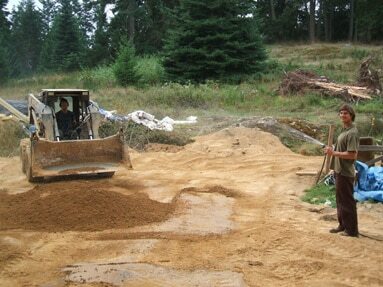 There was a silent retreat on the farm when we started so to keep the noise down we used traditional tamping and ended up doing the whole project that way. 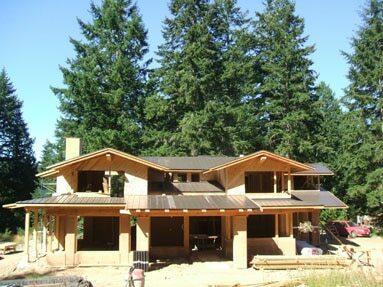 The house is shaping up nicely, always good to have the roof on. Showing the fine work on the sill and around the windows of Dewey and friends.